I have always been a dried fruit and nuts girl. I find them so satisfying and can easily and happily make a meal with just a handful of cashews. I also love granola, but I enjoy homemade best. There are so many recipes for granola out there. I’d love to try them all. Being a fast eater, granola also helps me slow down and chew due to the crunch factor. It’s a good thing. This recipe makes a bunch so it’s great for gifting too. Eat with a bowl of milk or sprinkle over yogurt, you’ll love it. 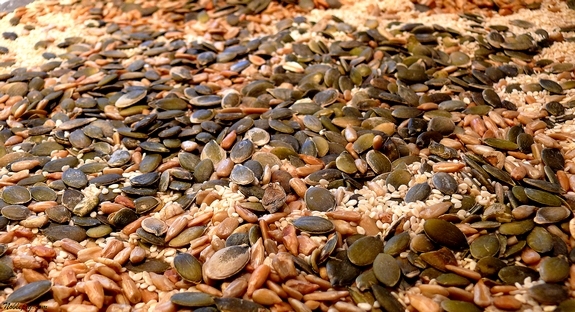 Toast sunflower seeds, sesame seeds and pepitas in a 350 degree oven on a baking sheet for 3 to 5 minutes or until slightly brown. After removing seeds, toast almonds and pecans for 5 to 8 minutes in the same temperature oven. In a large bowl stir together the oatmeal, wheat germ, coconut, almonds, pecans, sunflower seeds, sesame seeds, pepitas, brown sugar, cinnamon, and salt. In a small bowl whisk together the honey and oil. 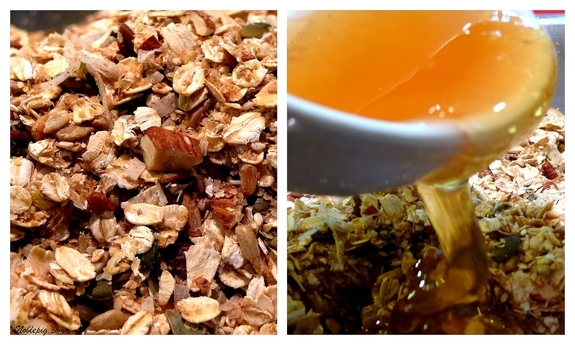 Pour the honey mixture over the oat mixture and stir until all of the dry mixture is coated. Spread onto two large rimmed baking sheets and bake in the lower or middle part of the oven for 30 minutes at 325 degrees, stirring at least 4 times. Stir in dried apricots and cherries and bake for another 10 minutes stirring once. Remove from oven and let cool, stirring every few minutes. This will easily be my breakfast for the next couple of weeks. Cooking Notes: One of the most important things about granola is not to let it burn in the oven. The original recipe called for an initial 45 minute baking time and then adding the dried fruit and baking for another 15 minutes. I could tell after 30 minutes this would be too long. Next time I make this I might even consider lowering the oven temperature to 300 degrees and see if that changes anything. I believe this is all due to your particular oven so you just have to watch it and be vigilant about the stirring. The granola continues to cook once out of the oven which is why it is very important to keep stirring it while it’s cooling. If you don’t, the granola will stick to the bottom of the baking sheet. To Give: Pack into a pretty canister or jar or cellophane gift bag tied with an attractive ribbon. To Keep: Granola will keep for up to 2 weeks in an airtight container before it begins to go stale. Or transfer to a zip-top freezer bag and freeze up to six months. I’ve never made granola, but this recipe is very tempting. It would be great to put together on a cold wintery day! Mmmm, granola. Sounds fantastic, I would love a handful or two for breakfast right now. Great picture too. I am also a “dried fruits and nuts girl”. When I visit my parents I have to make a trip to Trader Joe’s for trail mix and granola fix. I’ve even asked my mother to sip some to me here in Texas. This really looks delicious and is so easy to make. Want to try it during my holiday break. Beautiful photos! I could munch on this and be so happy. I love granola. To convert to gluten-free, I’ll just swap wheat germ for almond meal and use GF oats – yippee for easy! I love granola too, it makes such great gifts! 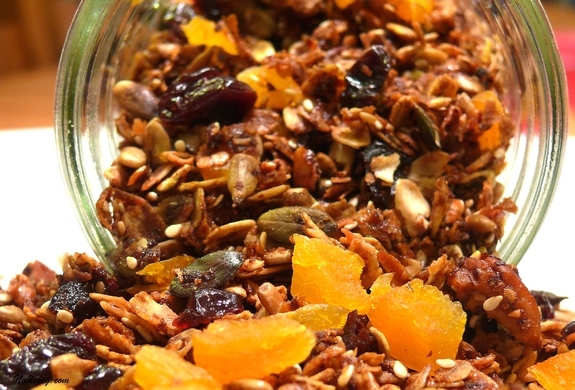 This looks like a great granola recipe! I’d love this on top of some yogurt in the morning. so not only is this a DELICIOUS blend of granola ingredients, but it’s so pretty too! i love the colors of the deep red cherries and bright orange apricots. beautiful! I make a similar granola, but bake it at 250 degrees for an hour, stirring every 10-15 minutes. I also add the fruit after all the baking is done. Comes out crunchy and yummy every time, and the fruit stays soft. I love granola and have never made it from scratch before and this looks fantastic. BTW, I love eating it over homemade vanilla ice cream. YUM! That’s how I like my granola – heavily studded with fruits and nuts. Love the fruit choices in here!! Overall beautiful coors. For reasons I don’t quite understand, I’ve never made granola. Your recipe is a standout and I’m sore tempted to try it. I love granola on my yogurt! This looks delicious and I will give it a try! 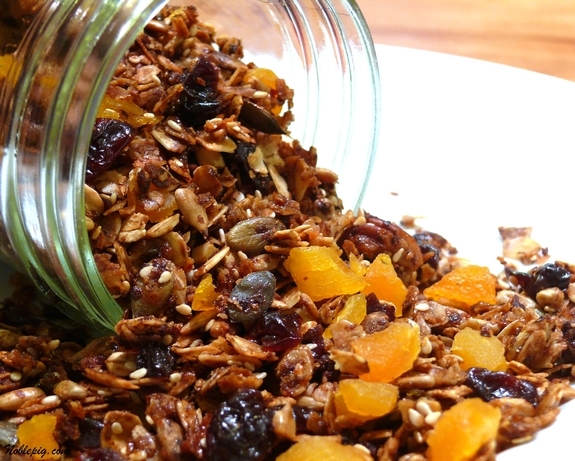 I love making granola – yours looks delicious Cathy. Homemade granola is the best! I really love apricots in granola. Very pretty and it would make an exceptional gift. Thanks for the idea! Major YUM, have ingredients, check. Have time, check. Have desire, check check. The local co-op has this granola we have labeled as crack because it is so good. I keep forgetting how easy it is to make too. Dang now I must make some this weekend. Beautiful looking stuff Cathy! Not to pimp my own blog [but I’m gonna] – for a great recipe using dried cherries, check out my post yesterday – the bomb!